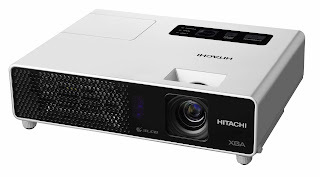 Bringing widescreen compatibility to presenters in a variety of environments, Hitachi America, Ltd., Ubiquitous Platform Systems Division today introduced the CPX3 3LCD mobile short-throw projector. Offering WXGA (1280 x 800) resolution, the CPX3 is specially designed for widescreen-format laptops and imaging applications that use 16:10 aspect ratios. The CPX3 features an HDMI terminal, allowing digital signals such as DVD players/recorders and HD to be transmitted digitally to the projector. Additionally, the CPX3 also offers a wide-angle lens, allowing the projector to be used close to the screen with no obstructions. It also allows for a large image to be projected in a small space. The CPX3 is extremely light at 3.9 pounds, making it easily portable, while the 2,000 lumens brightness ensures professional-quality performance. The CPX3 features a new remote control, adding “My Source” and Volume Up/Down functions. The CPX3 also offers closed captioning and input naming, allowing users to customize the names of the projector’s input sources. The CPX3’s security features include My Screen PIN lock, My Text and a transition detector. The CPX3’s built-in 1W speaker means no need for external audio devices, while the projector itself maintains a low noise level. 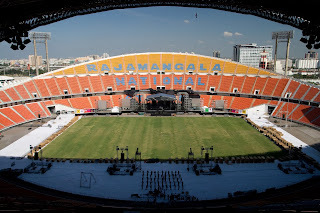 In a unique application that underscores the continued worldwide adoption of JBL Professional VERTEC® line arrays, Ten Years After Audio (TYAA), one of the leading audio rental firms in Thailand, provided the live sound system for the recent Assanee and Wasan Ram-Rai Concert at Rajamangala National Stadium in Bangkok. TYAA deployed VERTEC line arrays throughout the entire venue. 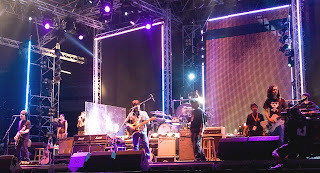 Brothers Assanee and Wasan Chotikul are popular, pioneering Thai rock artists. With a strong following of local fans and support by Thailand’s music industry for over 20 years, Assanee and Wasan are being heralded for having brought back the classic rock era of the ‘70s and 80s. Their latest production, the Assanee and Wasan Ram-Rai Concert, drew a sell-out attendance of more than 50,000 rock music fans. The event, organized by GMM Live in coordination with More Music, was hailed as the country’s biggest live music concert of the year in 2007. The audio system included a total of 54 VERTEC VT4889 full-size line array elements, configured as 30 enclosures for left and right main arrays serving the open field, with four clusters of six VT4889 line array elements each for delay fill to the rear audience areas in the stadium’s seating rows. In addition, six VT4888 mid-size line array elements were employed as out fill for increased horizontal coverage. A total of 36 VT4880 full-size arrayable subwoofers were co-located with the main left and right arrays to provide extended low-frequency support for high-level music. All VERTEC loudspeakers were powered by a total of 70 Crown MA-5002VZ amplifiers. Signal processing for all loudspeaker arrays was handled by six BSS Audio FDS-366T Loudspeaker Management Systems running JBL’s new V4 DSP presets, each working independently for their own zones. All incoming signal feeds for the BSS drive units came directly from the front-of-house mixer, for which Ten Years After Audio selected Soundcraft’s new flagship digital mixing console, the Vi6 Digital Live Sound Console. The event marked the first time a digital mixing console has been deployed for a major special event in the venue. All connectivity between the Stage Box of the Vi6 and the Local Rack in the FOH area was achieved via fiber-optic cable. Technical assistance for the event was provided by Harman Pro’s exclusive distributor for Thailand, Mahajak Development Co., Ltd. Ten Years After Audio can be reached at tenyearsafter@gmail.com. Industry pioneer John Eargle was posthumously awarded the 2008 Technical GRAMMY® Award at the Special Merit Awards ceremony in Los Angeles on the evening prior to the 50th GRAMMY Awards Telecast. The accomplished engineer, musician and longtime JBL Professional consultant passed away May 9, 2007, leaving a legacy of achievement in the areas of music recording, loudspeaker design, and education. The Technical GRAMMY Award is presented by vote of The Recording Academy®'s National Trustees to individuals who have made contributions of outstanding technical significance to the recording field. John Eargle was a member of the National Academy of Recording Arts and Sciences (NARAS) and engineered and/or produced over 275 albums, including GRAMMY Award-winning releases from Joe Williams and Ruth Brown. In 2001, John earned a GRAMMY Award for Best-Engineered Album, Classical for Dvorák: Requiem, Op. 89; Sym. No. 9, Op. 95 "From the New World." In 2002, John and other JBL engineers won a scientific and technical award from the Academy of Motion Picture Arts and Sciences for the concept, design and engineering of the modern constant-directivity, direct radiator-style motion picture loudspeaker systems. John Eargle earned degrees in music and electrical engineering from the Eastman School of Music (B.M. ), University of Michigan (M.M. ), University of Texas (B.S.E.E. ), and Cooper Union (M.E.). He was member of the Academy of Motion Picture Arts and Sciences; a member of the Society of Motion Picture and Television Engineers; a Senior Member of the Institute of Electrical and Electronic Engineers; a Fellow of the Acoustical Society of America and reviewer of electro-acoustical patents for the ASA Journal; and a Fellow, Honorary Member, and past president of the Audio Engineering Society, a member of the AES Journal Review Board and was awarded the AES Bronze Medal. During his 30-plus years with JBL, John Eargle championed the concept of flat power response in sound reinforcement applications, conceiving the application of bi-radial constant-coverage horns to both studio monitors and cinema systems. John also authored several books, including The Handbook of Recording Engineering, The Microphone Handbook, The Handbook of Sound System Design and The Loudspeaker Handbook. In early 2007, he completed The JBL Story: 60 Years of Innovation. Universal Cinema Services, one of the most successful cinema system consulting and installation firms in the United States, has enjoyed continued success with Harman Pro Cinema Group products, as evidenced by its installation of JBL Professional ScreenArray® loudspeakers and Crown DSi amplifiers in Rave Motion Pictures theaters across the United States. Based in Dallas, TX, Rave Motion Pictures owns more than 25 multiplex theaters throughout the Midwest and southern United States. One of the more upscale theater circuits in the country, Rave became the largest exhibition chain to outfit every screen in each theater with digital projection. Additionally, each screen offers digital surround sound and stadium seating. To provide an audio experience that meets the high standards for which Rave has become known, Universal Cinema Services has installed Harman audio systems in all Rave theater locations throughout the country. Many of these installations feature JBL Professional ScreenArray loudspeakers and Crown DSi amplifiers, which integrate seamlessly to deliver uniform coverage and unmatched clarity, while providing the power necessary for high-performance cinema systems. JBL Professional ScreenArray loudspeakers feature JBL’s best technical innovations, integrated in a system design that provides superior coverage, maximum power handling, and uniform acoustic power output, along with extremely low distortion. The ScreenArray design provides ideal power response and directivity control with seamless transitions between acoustic sections. The Crown DSi Series was engineered from the ground up for cinema applications and is composed of three two-channel amplifier models and an eight-channel system monitor. An intuitive front-panel LCD guides installers through the process of choosing loudspeaker signal processing presets and other system parameters. "Our company, Universal Cinema Services, has represented JBL and Crown for many years,” said Stan Lamb, President and Chief Operating Officer, Universal Cinema Services. “We are continually impressed with the high quality and competitive pricing that we can provide to our customers. The collaboration of JBL and Crown's engineering departments has produced matched components that are, we feel, superior offerings in the marketplace. The ‘wow’ factor that the latest generation of stage speakers and amps provides is nothing short of amazing. We look forward to our continued partnership with JBL and Crown as we work together toward the theater of the future." Demonstrating the company’s ability to provide unmatched audio quality for the world’s most technologically advanced theaters, the Harman Pro Cinema Group has announced that AudioMaster s.r.o. recently outfitted five theaters in a brand-new cinema complex with JBL Professional ScreenArray® loudspeakers and Crown DSi amplifiers. Located in Zilina, Slovakia, the new CineMAX multiplex opened last December. An example of the growing worldwide popularity of all-in-one shopping and entertainment centers, the new CineMAX in Zilina is part of a large, brand-new shopping center known as MAX that contains more than 100 stores. As such, one of the main goals of CineMAX was to provide an entertainment experience on par with the dynamic shopping experience of the brand new center. To accomplish this, a state-of-the-art sound system was imperative. The CineMAX in Zilina contains five theaters—three of identical size and two larger theaters of different sizes. In total, the five theaters contain 15 JBL ScreenArray screen channel loudspeakers, six 4642GS subwoofers and 72 cinema surround loudspeakers. A total of 32 Crown DSi Series amplifiers power the systems, which also feature a total of five DSi 8M system monitors. The largest theater also contains a foyer, which is equipped with five JBL Control 24C ceiling speakers, one Crown 28M mixer and one Crown XLS202D power amplifier. Leading cinema group Marcus Theatres® has recently installed a Digital-B-Chain™ Cinema sound system in its new UltraScreen® theater in Pickerington, OH. The Digital-B-Chain system features loudspeakers from JBL Professional and amplification, networking and processing from Crown Audio. The Harman Pro Cinema Group and Italian systems integrator Cinemeccanica, have designed and installed the world’s first complete multiplex Digital B-Chain™ cinema audio network for leading Russian cinema exhibitor, Cinema Park, at Cinema Park’s new 10 screen multiplex in Novosibirsk, Russia. The project is the first all Digital B-Chain installation with the entire multiplex utilizing DBC Systems in all 10 auditoriums. The DBC systems supplied by the Harman Pro Cinema Group and Cinemeccanica, include Crown CTs series amplifiers with DBC network modules and DBC network bridges and feature JBL Academy Award winning ScreenArray® cinema loudspeakers. The design and installation was made possible by the cooperative partnership of the HPRO Cinema Group, Cinemeccanica, and Cinema Park. At the heart of Cinema Park’s Digital B-Chain system is the DBC Network Bridge, which allows distribution of multiple channels of digital audio over a standard Ethernet network throughout Cinema Park’s multiplex keeping the entire digital audio signal path to remain in the digital domain until the final and only digital to analog conversion which takes place inside the amplifier via the DBC network modules. Each of the 10 DBC Bridges accepts eight channels of AES digital audio from each respective Dolby 650 cinema processor. A multitude of routing and equalization options are available in the DBC Bridge, which can be used for critical room tuning and all parameters can be stored, labeled, and recalled as one of 32 different presets. The DBC Bridge then distributes a packaged “single click” network that includes CobraNet® digital audio and system-wide control protocol to all 89 Crown CTs amplifiers on site. This packaged “single click” solution eliminates the need for multiple network runs between the DBC Bridge and the amplifiers, simplifying the design and eliminating excessive costs. Although Cinema Park expects to employ Digital Cinema projectors in all 10 auditoriums in the near future, two of them now use Cinemeccanica’s digital solution CLC3D2. In these auditoriums cinema patrons can be immersed in a completely digital experience including digital cinema projection and Digital B-Chain networked digital audio. The scope of the Harman system, featuring Digital B-Chain, Crown amps and JBL loudspeakers is a result of in-depth cooperation among the three parties and the unified vision shared by Harman, Cinema Park and Cinemeccanica. Massimo Riva of Cinemeccanica reveals how this shared vision resulted in such a system. This thinking is echoed by Stephen Morris, Harman Pro Group Vice President of Cinema Sales & Marketing who notes, “Cinema Park has clearly taken steps towards not only future proofing their new multiplexes with state-of-the art digital audio networking but their vision of implementing these technologies to the benefit of everyday business is commendable. Construction cost savings were immediately realized during installation thanks to use of inexpensive Ethernet networks. Now Cinema Park’s technical service and support groups will benefit as their DBC System can send them real time system wide diagnostic reports of Novosibirsk to their remote office in Moscow. NORTHRIDGE, CALIFORNIA, March 7, 2008 — Demonstrating the ease of rigging and superior coverage of JBL VERTEC® line arrays, live sound and lighting production company On Cue Systems of Phoenix, AZ recently provided the sound reinforcement system for a Barack Obama presidential campaign rally at Phoenix Veterans Memorial Stadium in Arizona. 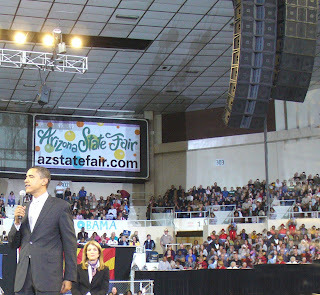 The “Stand For Change” rally drew more than 13,000 supporters and included appearances by Arizona Governor Janet Napolitano and Caroline Kennedy. In addition to the performance of the VERTEC line arrays, Myers noted, the loudspeakers’ light weight and simple easy to use suspension system facilitated a quick system setup. “The VERTEC system is extremely easy to rig and hang, and we used JBL’s VERTEC Line Array Calculator to determine the exact system configuration and splay angles,” Myers said. For complete product and company information, go to the JBL Professional website at www.jblpro.com. FRANKFURT, Germany – March 12, 2008 – AKG today announced the introduction of the new Perception Series of professional condenser microphones at the 2008 Musikmesse in Frankfurt, Germany. Designed for a wide range of applications used by ambitious hobby musicians as well as professional studios, the four new models included in the product launch provide superb audio quality and performance at a competitive price. The new AKG Perception Series includes the P 120, P 170, P 220 and P 420 – each offering a 20 dB attenuation pad and a low cut filter for an even wider range of miking capabilities including vocals, brass instruments, electric guitar amps and drums across multiple market applications of studio recording, live sound and broadcast. Designed and engineered in Vienna, Austria, the entire Perception line offers AKG’s signature sound quality captured in a rugged precision-tooled zinc/aluminum alloy body with a dent-resistant stainless steel grille screen. Perception P 120 is a general-purpose recording mic with a wide, extended frequency response. The 2/3-inch diaphragm condenser microphone offers users outstanding quality, performance and value, making it an ideal studio microphone for home recording and project studio use. Perception P 170 is a 1/2-inch diaphragm condenser microphone with a cardioid polar pattern. Designed for acoustic instruments, drums and percussion, the small diaphragm true condenser microphone delivers high quality AKG sound in both live and studio applications. Perception P 220 is a true one-inch diaphragm condenser microphone for studio recording and live sound applications on vocals, percussion, guitar, bass amps and acoustic instruments. The P 220 includes a switchable bass roll-off and a pre-attenuation pad, making it an ideal microphone for sources with high sound pressure levels up to 155 dB. Perception P 420 is a multi-pattern large-diaphragm condenser microphone for professional studio recording of grand piano, woodwind and brass instruments as well as drums and percussion. Offering high sensitivity and 155 dB maximum SPL, the P 420 delivers a warm transparent sound quality in a selection of cardioid, omni-directional or figure-eight pickup patterns. 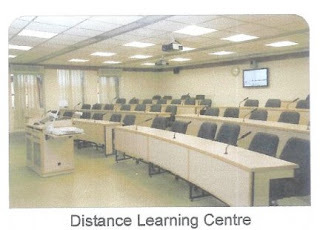 FRANKFURT, GERMANY, 12 MARCH 2008 — Bombay’s elite audio/video consulting group, Actis Technologies, has designed one of the country’s most advanced distance learning facilities, connecting faculty and students in the Bangalore campus with their remote center Chennai. The system’s audio processing is controlled by Biamp®’s AudiaFLEX CM with TrueSound™ acoustic echo cancellation. Since 1973, the Indian Institutes of Management (IIM) Bangalore has focused on training management students through technology –enabled education and research. With two campuses spread far apart, the institute’s goal is to provide the same learning experience in both locations using sophisticated, yet easy to use, technology for distance learning. The concept was to ensure that it was simple enough not to constrain teaching styles while still delivering the powerful audio and video presentations necessary. Multimedia projectors, flat screen displays, and video cameras contribute to the lesson plan, allowing both locations to view the professors as well as the material being displayed. Gooseneck microphones are installed on tables for student use, while the faculty uses wireless lavaliere microphones. In addition, there are multiple audio sources for a wide variety of teaching tools, with audio being processed from both locations. The AudiaFLEX seamlessly integrates the hardware and software and truly capitalise on the powers of CobraNet® to process and comprehensively distribute the audio. Biamp’s proprietary TrueSound™ algorithm offers the most advanced acoustic echo cancellation, allowing system designers, such as Actis, to create a distance learning environment where the audio can be flawlessly distributed via Cat-5 cable and its processing power accessed via touch panel controllers. For more information on Biamp Systems full line of products or to request a product catalog, please visit www.biamp.com. With built-in amplification and onboard DSP, the VRX932LAP line array loudspeaker and VRX918SP subwoofer offer proven tour sound technology in a compact system. FRANKFURT, GERMANY, 12 March 2008 — Addressing the MI market’s growing demands for loudspeaker technology that is on par with the world’s most sophisticated staging systems, JBL Professional is showcasing its new VRX932LAP 12-inch powered loudspeaker and the VRX918SP 18-inch powered subwoofer. The new powered VRX models incorporate the same innovative engineering found in JBL’s groundbreaking VERTEC® line arrays and offer built-in amplification from Crown, providing mobile DJ’s and musicians with accessibility to world-class, professional-grade technology. Utilizing the JBL DrivePack® DPC-2 amplification system designed in cooperation with Crown, both models are fully self-contained, powered loudspeakers. Retaining all the features of the original VRX932LA and VRX918S, self-powered performance has been optimized through integrated DSP, creating the simplest professional powered line array system in the industry. Designed for use in arrays of up to five units, the VRX932LAP is the ideal choice when line array performance is needed but the venue size does not call for the long-throw characteristics of large line array systems. The VRX932LAP is a 12-inch, two-way powered line array loudspeaker featuring a DPC-2 amplifier module that provides 1750 Watts of peak power. A DSP-based resident input module provides system optimization and equalization. The VRX932LAP features JBL Professional’s latest 2408J Annular Ring Diaphragm HF driver technology. The Constant Curvature Waveguide mounts three compression drivers on a continuous arc. When additional VRX932LAP loudspeakers are added to the array, the uninterrupted arc continues. In effect, all the drivers work together as if they were a single driver on a very long waveguide. Since there are three drivers in each VRX932LAP loudspeaker, the combined power handling and acoustic output of the system is far greater than a single driver could achieve. The VRX932LAP uses “amplitude shading” to shape the coverage of the array. For example, switches on the input plate control the output of each high-frequency section in the array. This allows users to set the upper enclosures in an array configuration to deliver more output to reach a distant balcony, while the lower box is shaded back to reduce excessive levels at the front of the listening area. This creates a more coherent sound field. One or two VRX932LAP loudspeakers may also be used on a tripod or over JBL VRX918SP, VRX918S or SRX718S subwoofers. The integrated rigging hardware is used to securely lock the array together while the dual-angle pole socket provides aiming flexibility. Suspended applications require the JBL VRX-AF array frame or eye bolts. Designed specifically for use in arrays with the VRX932LAP, the VRX918SP is a powered subwoofer system containing a 2268FF neodymium magnet patented Differential Drive®, 18-inch woofer in a front-loaded, vented enclosure. The VRX918SP features a built-in JBL DrivePack DPC-2 amplifier module designed in cooperation with Crown that provides 1500 Watts of peak power. A DSP-based resident input module provides system optimization, EQ and crossover functionality. The VRX918SP is equally at home in ground-stacked applications and is equipped with a top-mounted, threaded, 20-millimeter socket that can receive the optional SS4-BK pole. The VRX918SP’s enclosure is constructed of top quality birch plywood, coated in JBL’s rugged DuraFlex™ finish and is heavily braced to maximize low-frequency performance. The attractive CNC-machined, 16-gauge steel grille is internally lined with acoustically transparent foam to provide additional driver protection. The rear of the enclosure is fitted with T-nuts with may be used to attach the optional WK-4S caster kit. Harman Professional’s HiQnet™ system for remote control and monitoring. FRANKFURT, GERMANY, 12 March 2008 — Rounding out its VERTEC® Series line array family of powered and passive loudspeaker models for the professional tour/rental and performance-venue markets, JBL Professional today introduced, at Musikmesse 2008, the JBL VERTEC VT4889ADP Full Range High Directivity Line Array Element and the companion VT4880ADP Ultra Long Excursion Arrayable Subwoofer. Both models are integrated audio systems featuring field-proven JBL DrivePack® technology. Co-developed with Harman Pro Group sister companies Crown International and dbx Professional, the high-performance JBL DrivePack electronics modules with integral digital signal processing couple seamlessly with VERTEC loudspeakers. These latest powered full-size models in the JBL VERTEC DP Series deliver superb audio quality with robust reserve power, with digital electronics perfectly matched to the enclosures. The available JBL DrivePack DP-3 module features Crown’s exclusive BCA (Balanced Current Amplification) technology, incorporating Class I circuitry with temperature-compensated modulation. State-of-the-art feedback circuits enable the JBL DrivePack to set a new standard for performance in digital amplification, with lower noise and distortion specifications than other high-power switching amplifiers on the market. The units include an auto-sensing Universal Power Supply and a fan-free, passive, cooling design. The three-channel DP-3 offers a full rated output power of 6,000 watts peak, 3,000 watts continuous (at load) for the VT4889ADP, and 6,900W peak, 3,500W continuous for the VT4880ADP subwoofer. The standard input module from dbx features analog audio inputs, dbx’s Type IV™ analog-to-digital conversion circuitry, and sophisticated onboard digital signal processing technology. Precision bandpass limiting, pre-equalization filters and automatic self-test functions ensure optimized performance. The modular input bay design allows for insertion of optional networked modules. The VT4889ADP and its companion subwoofer, the VT4880ADP, are pre-configured from the JBL factory with JBL’s new V4 DSP preset data, developed with the aid of JBL’s exclusive LDM™ (Loudspeaker Data Manager) software, and offering optimized acoustical performance. The VT4880ADP 2 x 18-inch arrayable subwoofer is a high output, lightweight companion subwoofer to complement VT4889ADP full-range loudspeaker systems. It is fitted with two new 457 mm (18 in) model 2269G ultra long-excursion low frequency transducers, each of which is rated at 2000W continuous, 8000W peak. The subwoofer is capable of delivering 137 dB SPL (1 m). This powered subwoofer weighs only 99.9 kg (220 lb), enabling the construction of extremely powerful VLF (Very Low Frequency) arrays of multiple units. The unit is designed to be suspended in stand-alone arrays, coupled with VT4889ADP’s in the same array, or ground-stacked as required. The optional networked DPCN (Cobranet™-compatible) input modules from Crown allow JBL VERTEC DP Series systems to link seamlessly into Harman Professional’s HiQnet™ system. With optional network modules installed, users have remote control and monitoring access to system functionality and digital speaker presets, via System Architect software. HiQnet compliance ensures that VERTEC DP Series system products offer a variety of configuration and monitoring functions, through software control panels that address not only JBL DrivePack-equipped loudspeakers, but also other HiQnet-compliant audio products from Harman Professional companies that may be integrated into a sound system. Most passive system enclosures in the VERTEC Series, including the VT4889-1 and VT4880A upon which the new powered DP Series versions are based, are pre-engineered to be JBL DrivePack-compatible. This allows existing VERTEC system owners, as well as new customers, to leverage the distinct performance and business advantages the JBL VERTEC DrivePack technology platform can provide, with JBL DrivePack retrofit kits. 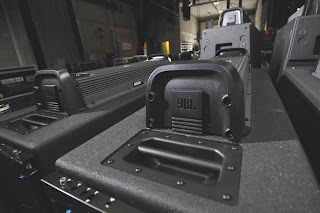 These advantages include reduced system configuration costs, less concern over cooling needs in low-noise environments like performing arts centers due to the JBL DrivePack’s fan-free design, and transportation and installation savings due to lower space requirements when compared to traditional amplifier racks. FRANKFURT, GERMANY, 12 March 2008 — Marking the first commercial use of JBL Professional’s new powered full-size VERTEC® VT4889ADP full-range line array element and VT4880ADP companion subwoofer with JBL DrivePack® technology, San Diego-based Meeting Services Inc. is providing audio, lighting and projection needs for the national tour of “Love, Janis.” The musical theater production is based upon the life and music of 60's rock-and-roll icon Janis Joplin. Inspired by the best-selling book, "Love, Janis" by Laura Joplin, the singer's younger sister, the show’s entire spoken text comes directly from Janis Joplin herself--from actual letters to her family and from her many press, radio and TV interviews. The show is presented by Columbia Artists Theatricals (CAT), which specializes in the distribution and production of commercial and theatrically staged live entertainment on a worldwide basis. The production features general management by Paul Rambacher, set design by Norman Schwab, tour light and projection design by Jeffrey Cady using original 1960s psychedelic lightshow images from San Francisco's legendary Bill Ham, and sound design by Eric Stahlhammer. sound as the production moved through classic Janis Joplin songs like "Piece of My Heart," "Down On Me," "Ball and Chain," "Mercedes Benz" and "Me and Bobby McGee." "The brand-new VT4889ADP system is powerful and full-bodied, with its 15-inch low-frequency woofers. It has all the acoustical hallmarks of the standard VT4889 with the addition of integrated power and digital signal processing,” commented Stahlhammer, a veteran theatrical sound designer who has designed sound for tours of "Csardas" and "Gypsy Spirit" and counts numerous music-based productions like "Always...Patsy Cline," "Almost Heaven: Songs and Stories of John Denver" and "Hank Williams: Lost Highway" among his credits. "Having a powered speaker system for this production saves us both setup time and backstage space. Now that Meeting Services has supplied this new audio package for the tour, I can't imagine using any other system to do this show." The JBL VERTEC VT4889ADP full-range, high directivity line array element and companion VT4880ADP Ultra-Long Excursion arrayable subwoofer are integrated audio systems featuring field-proven JBL DrivePack technology. The VT4889ADP weighs only 93.1 kg (205 lb) and each unit is capable of delivering 143 dB SPL maximum output (1 m). The VT4880ADP subwoofer is capable of delivering 137 dB SPL (1 m) and weighs only 99.9 kg (220 lb), enabling the construction of large, extremely powerful arrays of multiple units. The subwoofer is designed to be suspended in stand-alone arrays, coupled with VT4889ADP's in the same array, or ground-stacked as required. The high-performance JBL DrivePack electronics modules include an auto-sensing Universal Power Supply and a fan-free, passive, cooling design. The standard input module features analog audio inputs, dbx's Type IV™ analog-to-digital conversion circuitry, and sophisticated onboard digital signal processing technology. Precision bandpass limiting, pre-equalization filters and automatic self-test functions ensure optimized performance. The modular input bay design allows for insertion of optional networked modules, which offer users a choice of digital audio and remote control and monitoring access via HiQnet™ System Architect software. The VT4889ADP and its companion subwoofer, the VT4880ADP, are pre-configured from the JBL factory with JBL's new V4 DSP preset data, developed with the aid of JBL's exclusive LDM™ (Loudspeaker Data Manager) software, and offering optimized acoustical performance. For front fill applications, Stahlhammer's sound design for "Love, Janis" includes JBL's compact VRX928LA two-way loudspeakers, arrayed on the stage lip to cover forward seating rows in the theatrical playhouses on the national tour. "I can see numerous applications for JBL speakers in touring theatrical-style productions," observed Stahlhammer. "My design criteria has always been to give audiences the best sound possible in coordination with a given script and stage set. This system package is giving us excellent results from both a sonic and practical point of view, and the show has been getting excellent reviews. The audience is on their feet and singing along, every night." “Love, Janis” will be appearing for multiple nights at theater venues in New York, Pennsylvania, Connecticut, Massachussets, Ohio, Texas and California through June including Philadelphia’s Zellerbach Theater, Boston’s Majestic Theater, Los Angeles’ Wilshire Theater, and Modesto’s Gallo Center for the Arts. "Touring musical theater productions like 'Love, Janis' can be very challenging for production crews, as setup restrictions, limited backstage space and cross-country travel put time at a premium for stagehands and traveling crews alike," noted David Scheirman, Vice President of Tour Sound, JBL Professional. “These new powered full-size models provide a comprehensive set of solutions for high-end, powered loudspeaker applications. We're encouraged to see how this new system is assisting professional users in not only the traditional concert rental and corporate A/V production segments, but also those who serve theatrical and performing-arts environments." Grandmaster Flash is recognized as the first DJ to use a turntable as an instrument, preceding the late-1970s emergence of Grandmaster Flash and the Furious Five, one of the first groups to feature rapping over beats. These innovations placed Grandmaster Flash at the epicenter of hip-hop, and in 2007 Grandmaster Flash and the Furious Five became the first hip-hop act to be inducted into the Rock and Roll Hall of Fame. While maintaining a steady schedule of live performances, Grandmaster Flash plans to have “The Bridge” ready for release later this year. “I’m in the musical stages at the moment and haven’t decided which vocalists I’ll be working with yet, but I’m having a lot of fun taking all these ideas I’ve had on my voice recorder for the past 10 years and putting them together,” Flash said. 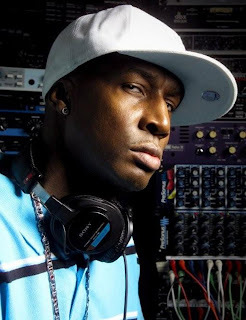 Grandmaster Flash’s memoirs, “The Adventures of Grandmaster Flash--My Life, My Beats,” penned by David Ritz, is scheduled for release June 10, 2008. Please visit www.grandmasterflash.com for more information. The Harman Pro Group (www.harmanpro.com) is the world’s largest provider of professional audio products and system solutions for commercial sound, contracting, tour sound, recording and broadcast, musician, portable PA and cinema applications. The AE Compact series features eight new loudspeaker models, providing greater flexibility for system designers and integrators. FRANKFURT, GERMANY, 12 March 2008 — Expanding on its immensely popular Application Engineered (AE) Series loudspeakers, JBL Professional today introduced eight new compact AE Series loudspeaker models at Musikmesse 2008. The new AE Compact loudspeaker series provides even more options for system designers and integrators in a variety of applications. The new AE Compact loudspeaker family consists of eight high-output, 2-way loudspeaker models incorporating either single or dual woofers, including 5.25-inch, 6.5-inch, and 8-inch transducers. The high-frequency sections include a one-inch dome tweeter for two models (AC15 and AC25), while the remaining six models incorporate one-inch exit compression drivers. The AC18 and AC28 models offer the system designer a choice of rotatable Progressive Transition™ waveguides with coverage patterns of 90 x 50 degrees or 120 x 60 degrees. In addition to providing smooth, low-distortion sound, Progressive Transition waveguides deliver uniform off-axis frequency response to every point within the intended coverage area, not just in the horizontal and vertical planes. PT Waveguides combine outstanding pattern control with undistorted sound for natural music and intelligible speech. The AC25, AC26 and AC28 models incorporate JBL’s Filtered Array Technology (FAT™), which allows each of the low-frequency transducers to be independently controlled for magnitude and phase response, resulting in smoother power response and constant coverage. Adding to the flexibility of the AE Compact models are the multiple attachment points strategically located on each model for ease of mounting either with an optional U-bracket or with an OmniMount® type mounting bracket. Additionally, the AC16, AC26, AC18, and AC28 models include attachment points on the bottom of each enclosure for a stand mount accessory. Every enclosure is constructed with multi-ply hardwood and finished with JBL's proprietary DuraFlex™ paint for the utmost in strength and durability. Each loudspeaker system utilizes “best in class” components and is voiced to work with all AE Series loudspeaker systems. In addition, each transducer has been subject to JBL's grueling 100-hour torture test to ensure years of trouble-free operation. AC15 ultra-compact, 2-way loudspeaker system with one 5.25-inch low-frequency transducer, weighing 4.75 kg (10.5 lb), with a power rating of 150W Continuous, 600W Peak and a coverage pattern of 90 x 90 degrees. AC25 ultra-compact, 2-way loudspeaker system with one 5.25-inch low-frequency transducer, weighing 7.5 kg (16.5 lb), with a power rating of 225W Continuous, 900W Peak and a coverage pattern of 90 x 90 degrees. AC16 ultra-compact, 2-way loudspeaker system with one 6.5-inch low-frequency transducer, weighing 7.2 kg (15.8 lb), with a power rating of 200W Continuous, 800W Peak and a coverage pattern of 90 x 90 degrees. AC26 ultra-compact, 2-way loudspeaker system with two 6.5-inch low-frequency transducers, weighing 11.0 kg (24.3 lb), with a power rating of 300W Continuous, 1200W Peak and a coverage pattern of 90 x 90 degrees. AC18/95 compact, two-way loudspeaker system with one 8-inch low-frequency transducer, weighing 12.8 kg (28.2 lb), with a power rating of 250W Continuous, 1000W Peak and a coverage pattern of 90 x 50 degrees. AC18/26 compact, two-way loudspeaker system with one 8-inch low-frequency transducer, weighing 12.8 kg (28.2 lb), with a power rating of 250W Continuous, 1000W Peak and a coverage pattern of 120 x 60 degrees. AC28/95 compact, 2-way loudspeaker system with two 8-inch low-frequency transducers, weighing 18.6 kg (40.9 lb), with a power rating of 375W Continuous, 1500 Peak and a coverage pattern of 90 x 50 degrees. AC28/26 compact, 2-way loudspeaker system with two 8-inch low-frequency transducers, weighing 18.6 kg (40.9 lb), with a power rating of 375W Continuous, 1500 Peak and a coverage pattern of 120 x 60 degrees. LITTLE FERRY, NJ, MARCH 19, 2008 — Peter Thorn is one of the world’s most in-demand guitarists, having worked in the studio and toured with the likes of Chris Cornell, Alicia Keys, Brian Ray, Ben Jelen, and many others. He is currently using Eventide’s new effects pedal, TimeFactor, in the studio and will be incorporating it into his touring rig, as well. Eventide, the foremost provider of studio quality effects for more than 37 years, has brought that knowledge to bear on TimeFactor, providing guitarists with a flexible performance tool, delivering studio quality effects in a sturdy, compact package. Thorn is well-known for his resourcefulness as a guitarist and for delivering the right sounds at the right times, the very definition of an excellent musician. The versatility of the Eventide TimeFactor, with numerous presets and the ability to access so many great sounds so easily, provides Thorn with a powerful musical resource. Having used the celebrated Eventide H3000 for years in the studio, Thorn was eager to see that there was finally a pedal that could deliver the sound depth and clarity that studio device was known for. The great sound, programmability, and convenient form factor make it the natural choice for guitar players. Eventide has taken its 10 best delay effects of the last 37 years and built them into a compact package. TimeFactor works great in the studio and holds up as a robust road tool that fits on a pedal board. TimeFactor includes 10 stereo or dual mono delay effects, including Digital Delay, Vintage Delay, Tape Echo, Modulated Delay, and Ducked Delay, as well as Band Delay, Filter Pong, MultiTap Delay, Reverse Delay, and Looper. In addition, instant program change makes it a snap to operate as do real time control with 10 knobs or the use of MIDI or expression pedal. Tap tempo and MIDI clock lock your delays to the beat. TimeFactor includes 20 factory presets, and an unlimited number of user presets through MIDI. TimeFactor offers true analog bypass, is housed in a rugged cast metal construction featuring reliable metal footswitches for instant preset access. TimeFactor is upgradeable through USB 2.0 for registered owners at eventide.com. Visit Eventide online at eventide.com. LITTLE FERRY, NEW JERSEY, March 10, 2008 — Online and catalog retailer, Sweetwater, has been named the recipient of Eventide’s 2007 Dealer of the Year Award. Based out of Fort Wayne, Indiana, Sweetwater is one of the premier retailers of Eventide’s line of products. Sweetwater was founded 27 years ago in Fort Wayne, Indiana, and is the country's most respected dealer in technology equipment for musicians, recording studios, and broadcasters. Sweetwater customers range from beginners to rock stars. Sweetwater’s customers can be found in Los Angeles, New York, and Nashville recording studios, TV and radio stations all across the country, as well as in tens of thousands of home recording studios nationwide. Sweetwater maintains a commitment to the highest level of customer service in the music technology industry. Little Ferry, NJ, March X, 2008 — Eventide’s Anthology II TDM Plug-ins bundle recently helped celebrated film sound mixer, Alan Meyerson, meet a challenge on the recently completed mix for the soundtrack of the soon-to-be-released action film, Iron Man. Working with composer Ramin Djawadi, Meyerson was mixing a largely rock soundtrack and was looking for the right sound without it being excessively reverb-heavy. The soundtrack for the film was mixed at Hans Zimmer’s Remote Control Studios. Initially, Meyerson wasn’t even aware that the studio had the Anthology II bundle. That is, until he discovered the reverb that, he says, has replaced all the other reverbs. Meyerson has found it ideal for percussion, and with a brilliant top end that avoids being harsh, he’s found it to be perfect for guitars and anything with a quick transient response. Anthology II features 15 plug-ins and gives artists and engineers powerful solutions for all their production needs. Anthology II offers six new plug-ins to the Anthology bundle: two 48-bit double precision vintage equalizers; EQ65 Filter Set and EQ45 Parametric Equalizer, both 48-bit double precision; two new configurable channel strips, Ultra-Channel™, featuring Eventide's signature micropitch shifting effect for thickening, and E-Channel™, optimized for maximum instances; Precision Time Align™, provides the ability to bring individual tracks into phase; and Quadravox™, a four-voice diatonic pitch shifter with delays. Anthology II also includes the latest versions of the nine plug-ins that comprised the original best-selling Anthology bundle: H910, H949, Instant Phaser™, Instant Flanger™, Omnipressor®, Eventide Reverb, Octavox™, H3000 Band Delays™, and H3000 Factory™. Like Anthology, Anthology II is fully compliant with ICON, D-Control, D-Command, Venue, Pro Tools 7.2, and is Mac and PC compatible. Visit Eventide on the Web at www.eventide.com. FRANKFURT, GERMANY, 12 March, 2008 — Coincident with the opening of the ProLight & Sound exposition here today, the Harman Pro Group debuted HiQnet™ System Architect™ Version 1.7, providing systems integrators and tour sound professionals with an updated, streamlined tablet PC interface and quicker operation for on-the-fly repurposing of racks and arrays. According to Rick Kreifeldt, Vice President Harman Pro System Development & Integration Group (SDIG), the new developments are a product of end-user input and focused particularly at the tour sound and performance installation markets, and within those, particularly for the tablet PC user. New additions to System Architect version 1.7 include a new ‘System Browser’ navigation interface aimed primarily at the tablet PC user, which provides the same ease-of-use experience and familiarity of navigation as browsing the Internet — optimizing the application display and featuring browser-style navigation buttons. This new navigation philosophy can also be used in the more standard ‘Desktop’ mode. System Architect version 1.7 also includes new context-sensitive, alphanumeric keypads which automatically pop up when a value or text entry box is selected with the stylus, each of which is optimized to provide buttons relevant to the parameter units – kHz and Hz for example. This enables the tablet PC user to easily enter specific values directly into the application interface. Tablet PC users will also appreciate the new automatic adjustment of the Windows screen resolution to 1024 x 768 to maximize the screen real estate when entering Tablet Mode. The philosophy of repurposing elements of system design on a more macro level was one of the main focuses of the current release of System Architect, version 1.6, which included Partial Venue File Export: the ability to save the settings of a user-determined selection of devices and associated Custom Control Panels within an open Venue file to disk. If the user already has an existing system configuration which includes a rack of amplifiers, a line array configuration or a zone of devices, for example, it can now be very easily repurposed in additional system designs. Along with the ability to export such sub-systems, System Architect version 1.6 also introduced Venue File Import: the ability to import a complete existing Venue File into the open configuration including all the device configurations and Custom Control Panels it contains. These two features together create an extremely powerful sharing of existing data between system designs and also for the building of libraries of sub-systems for contracting firms to share amongst staff. Harman HiQnet is the world’s first connectivity and control protocol that integrates all product categories in the signal chain for professional audio systems of all types, size, and applications. Harman HiQnet no longer requires the user to manage multiple disparate operating systems or be responsible for programming individual signal processors, speaker controllers, wireless microphone systems, and mixing consoles. HiQnet was developed by the Harman Pro Group System Development and Integration Group (SDIG), a team of dedicated systems specialists based in Salt Lake City, Utah. Headquartered in Northridge, California, the Harman Pro Group is part of Harman International Industries, Incorporated (www.harman.com), a leading manufacturer of high-quality, high fidelity audio products and infotainment systems for the automotive, home and professional markets. InfoComm Academy, providing experienced AV professionals with comprehensive educational programs on new and emerging technologies and techniques, is also supported by Biamp Systems’ commitment to education and training. FRANKFURT, GERMANY, 12 March, 2008 — In a further demonstration of its continuing and evolving commitment to technology education and training, Biamp® Systems is partnering with InfoComm on two critical programs to populate the audio video contracting community with the best-suited, best-trained and best-informed integration professionals available. Biamp Systems is supporting InfoComm’s new AV CareerCorps Program that is designed to educate job-seekers about AV career opportunities, identify people who want to work in the AV industry, and provide them with a basic level of training from which to build. Members of the CareerCorps were taught both interpersonal and technical skills that are required in the AV industry. After the training was completed, eight industry leaders interviewed program participants on the spot for open positions in their AV companies. Biamp Systems is also a sponsor of the InfoComm Academy AV Advanced Design Course training program in Johannesburg, South Africa. Co-produced by EMS Africa and InfoComm Africa in partnership with AV Specialist magazine, InfoComm Academy AV Advanced Design Course provides comprehensive technology and best practices training in new and emerging technologies and techniques. The AV Advanced Design Course comprises three three-day modules: EMS Africa hosted 30 experienced AV professionals and four university students for the first module in October, will host the second module in March and the third and final module is planned for May this year. “At Biamp Systems we recognize that the optimum performance of our technologies is ultimately contingent upon the skills of the integrator,” explained Steve Metzger, Biamp Systems Vice President of Business Development. “It’s for this reason that we work closely with integrators to design and build products that address their needs — but also why we work with InfoComm, EMS Africa and the integration community to ensure professional education and training services are current, comprehensive — and widely available! LITTLE FERRY, NEW JERSEY, March 10, 2008 — Eventide today named Quest Marketing as the recipient of Rep of the Year Award for 2007. Located in Miami Beach, Florida, Quest Marketing represents the Eventide product line in the Southeast U.S. and Puerto Rico. Quest Marketing encompasses two divisions focused on the markets of Pro Audio/Video, and Musical Instruments & Electronics. They began their relationship with Eventide in 2001. Their expert sales team has been servicing accounts in Alabama, Florida, Georgia, Mississippi, North Carolina, South Carolina, Tennessee and Puerto Rico from their main offices in Miami and satellite offices in Atlanta, Memphis, Nashville, Orlando and Raleigh. Founded in 1971 in New York City, Eventide is a leading developer and manufacturer of digital audio processing products for recording, broadcast, and live performance. Headquartered in Little Ferry, NJ, Eventide invented the H910, the first Harmonizer® effects processor, in 1975, and introduced the H3000 Ultra-Harmonizer effects processor in 1987. Visit Eventide online at eventide.com. Eventide and Harmonizer are registered trademarks of Eventide Inc. © 2008 Eventide Inc.